You can’t change the number of hours in the day. However, you can change the way you make use of them. 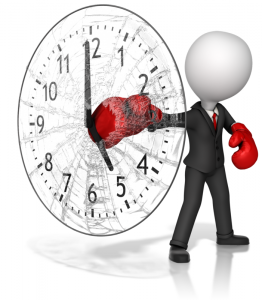 If you want to get more done in 2015, be on the lookout for these time wasters. According to Business Insider*, as many of a third of meetings are unproductive, costing an estimated $37 billion. Make the most of your time by only agreeing to meetings where you know you can add value and avoid ones that will be full of people talking around in circles. If you don’t want to be left out of the loop, consider asking for the meeting minutes. Additionally, don’t default to the standard one hour meeting. Try and keep it short and sweet. These can take the form of a colleague who wants to chat, a phone that’s constantly buzzing or an endless deluge of emails. In any case, these little distractions can prevent you from focusing on your key obligations. Carve out a solid block of time in which you devote yourself to work. Let your calls go to voicemail, disable your email notifications and feel free to tell anyone who stops by you are not free to talk. Once you disengage from the essential tasks, you can turn your attention to these minor matters. A survey by the National Association of Professional Organizers found that 47 percent of respondents report losing time at work due to clutter**. Make clearing out your desk one of your New Year’s Resolutions, and you won’t waste time looking for lost items. Not to mention, removing excessive stimuli from your workspace can help you focus better, boosting your productivity. Chances are you can’t change the length of your daily commute. But those hours needn’t be lost. Plan out what you would like to accomplish during the day. Listen to an audio book that will aid your career development. If you usually get stuck in traffic, make use of a hands-free cell phone to tackle a few calls before you head into work. There are 356 days left in the year. Don’t let these time wasters cut them short. And if there any other distractions you face at work, let us know in the comments! **J.J. McCorvey, “The Real Consequences of Office Clutter,” Inc. This entry was posted in Clients, Currently Employed and tagged New Year Resolutions, productive, productivity tips. Bookmark the permalink.